At AdvantEdge, we promise to adapt our services to meet your needs, whatever they may be, even as your organization evolves. Our main goal is to take the logistical chores involved with running a company (handling mail and courier services, making sure Internet and printers are running smoothly, keeping the kitchen stocked with everyone’s favorite teas and coffees, etc) out of your hands, in order to let you focus on the big-picture goals of your business. Full-service workspaces are flexible in providing unique offerings for businesses in all stages of development. Virtual Office plans provide phone-answering and mail services as well as access to business lounges and open workspaces with options for conference room use and other amenities depending on your needs. Our full-service workspaces provide the same amenities and support while giving your business a private, secure workspace to use 24/7. We can provide offices for businesses with a single employee as well as office suites to accommodate larger businesses and everything in between. Just because your business changes, that doesn’t mean your location needs to. 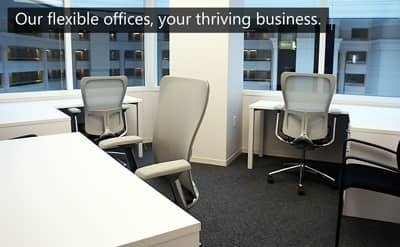 Many of our clients stay with us for over 5 years, and we are committed to making sure our office is always the right fit, even if that requires additional workspace for your growing company or remodeling the offices you already have. Indeed, we are so willing to adapt to fit your company that we will literally knock down walls for you (and have done so for other clients before!) in order to ensure that your physical office meets all of your company’s needs and expectations. At AdvantEdge, we know running a business can be unpredictable, even when you do structure for success. We’ve seen it all and we are always ready to help you tackle whatever challenges come your way quickly and efficiently. The flexibility AdvantEdge provides will create the perfect environment for your business to grow and thrive. 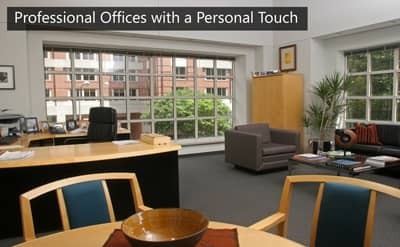 To learn more about our workspaces and office options click the button below or call us at (202)448-1010.